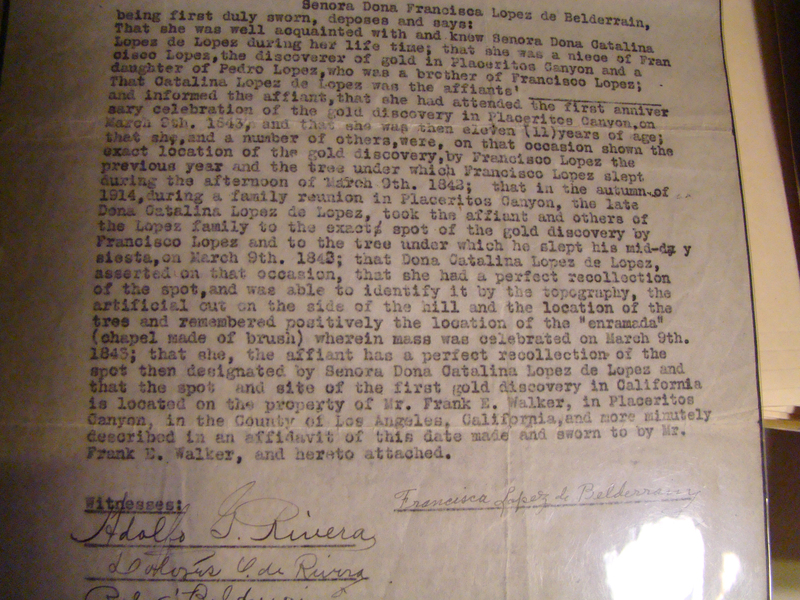 Francisca Lopez de Belderrain's Affidavit Re: Gold Discovery Site. 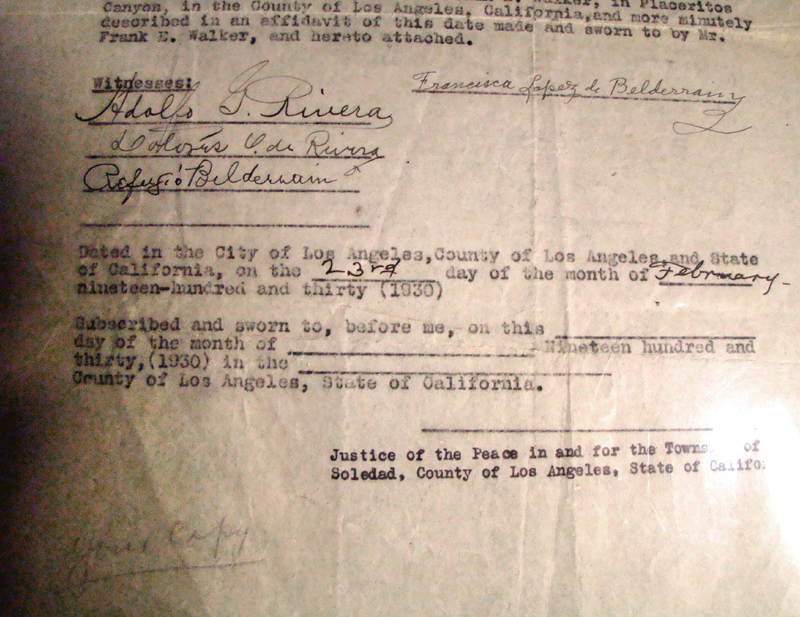 Judge Arthur B. Perkins' personal copy of Francisca Lopez de Belderrain's affidavit of Feb. 23, 1930, wherein she swears that in 1914, Francisco Lopez's niece, Catalina, showed her the oak tree whereunder Francisco Lopez napped on March 9, 1842, and the exact spot where he subsequently discovered gold; Catalina having learned the information from Francisco Lopez in 1843 when she was 11. COUNTY OF LOS ANGELES. ) 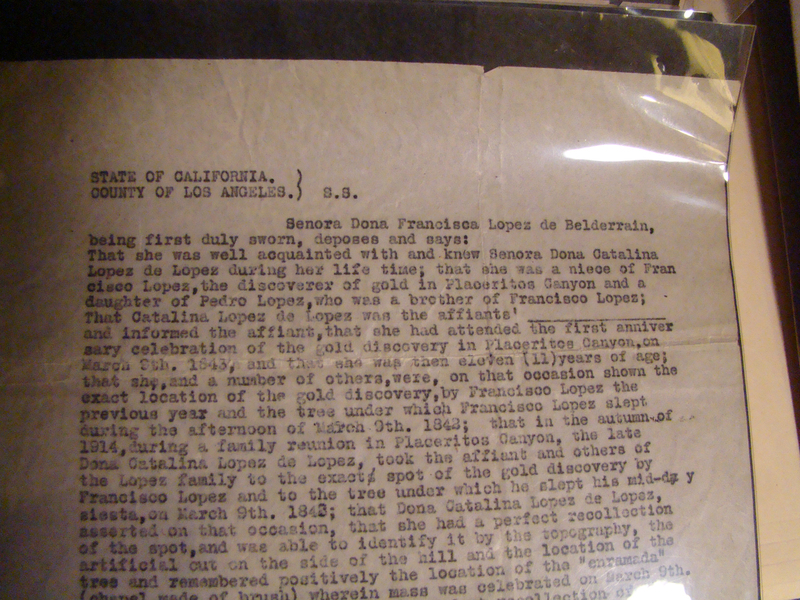 S.S.
That Catalina Lopez de Lopez was the affiants' ______ and informed the affiant, that she had attended the first anniversary celebration of the gold discovery in Placeritos Canyon, on March 9th, 1843, and that she was then eleven (11) years of age; that she, and a number of others, were, on that occasion shown the exact location of the gold discovery, by Francisco Lopez the previous year and the tree under which Francisco Lopez slept during the afternoon of March 9th, 1842; that in the autumn of 1914, during a family reunion in Placeritos Canyon, the late Dona Catalina Lopez de Lopez, took the affiant and others of the Lopez family to the exact spot of the gold discovery by Francisco Lopez and to the tree under which he slept his mid-day siesta, on March 9th, 1842; that Dona Catalina Lopez de Lopez, asserted on that occasion, that she had a perfect recollection of the spot, and was able to identify it by the topography, the artificial cut on the side of the hill and the location of the tres [sic] and remembered positively the location of the "enramada" (chapel made of brush) wherein mass was celebrated on March 9th, 1843; that she, the affiant has a perfect recollection of the spot then designated by Senora Dona Catalina Lopez de Lopez and that the spot and site of the first gold discovery in California is located on the property of Mr. Frank E. Walker, in Placeritos Canyon, in the County of Los Angeles, California, and more minutely described in an affidavit of this date made and sworn to by Mr. Frank E. Walker, and hereto attached. Described and sworn to, before me, on this ______ day of the month of ______ Nineteen hundred and thirty, (1930) in the ______ County of Los Angeles, State of California. Justice of the Peace in and for the Township of Soledad, County of Los Angeles, State of California. Webmaster's note: Perkins was the justice of the peace at the time. 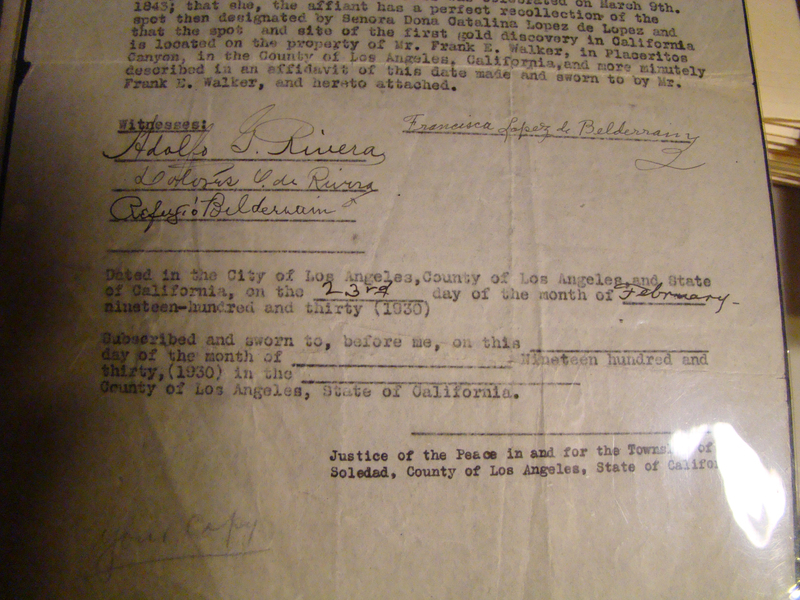 It's unfortunate that Francisca's familial relationship to Catalina is left blank in this document. AP9011: 19200 dpi jpeg from digital image by Leon Worden, 3-2-2008, of original document in A.B. Perkins private collection.